How Much Can You Afford? Get Pre-Qualified! Realtors don't charge buyers to help them buy a home. When the seller of a home lists thier property with a Realtor, the agency charges them a fee. The fee is usually 6% of the sales price, payable only when the home sells. More than likely, another agent will bring the buyer for that home. The listing agent will split the commission with the buyers agent. Why is that you ask? Most agents are members of the local Board Of Realtors® even though they work for different brokerages. Threrfore, we all put our listings in the MLS® Database that is managed by the Board of Realtors®. So why do buyers avoid working with one Realtor, and just call the phone number on the sign in front of the house they would like to see? The agent who's sign is in the yard is under contract to get that owner the best price that the market will bear, and represents that seller. The smart thing to do for a buyer would be to work with thier own agent that will represent their best interest thoughout the process of buying. 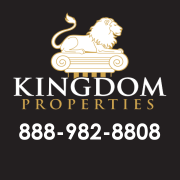 Please contact Kingdom Properties if you have any questions about buying a home in Central Texas or elsewhere in Texas. Below, select desired reports and complete the form provided.